See my review of Volume 2 of this edition here. Favorite Line: "[Love in Heaven] is a brief love, Chitrasena, with no bond of any kind as comes from sharing a mortal life together, its joy and grief, its trials, its long, uncertain years... Surely, love on earth is quieter; but it is a deeper, longer thing, touched with more sorrow than ever comes to this place." 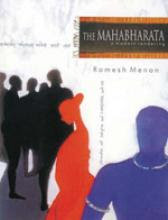 (From Amazon.com) Book Description The Mahabharata is the more recent of India's two great epics, and by far the longer. First composed by the Maharishi Vyasa in verse, it has come down the centuries in the timeless oral tradition of guru and sishya, profoundly influencing the history, culture, and art of not only the Indian subcontinent but most of south-east Asia. At 100,000 couplets, it is seven times as long as the Iliad and the Odyssey combined: far and away the greatest recorded epic known to man. The Mahabharata is the very Book of Life: in its variety, majesty and, also, in its violence and tragedy. It has been said that nothing exists that cannot be found within the pages of this awesome legend. The epic describes a great war of some 5000 years ago, and the events that led to it. The war on Kurukshetra sees ten million warriors slain, brings the dwapara yuga to an end, and ushers in a new and sinister age: this present kali yuga, modern times. At the heart of the Mahabharata nestles the Bhagavad Gita, the Song of God. Senayor ubhayor madhye, between two teeming armies, Krishna expounds the eternal dharma to his warrior of light, Arjuna. At one level, all the restless action of the Mahabharata is a quest for the Gita and its sacred stillness. After the carnage, it is the Gita that survives, immortal lotus floating upon the dark waters of desolation: the final secret! With its magnificent cast of characters, human, demonic, and divine, and its riveting narrative, the Mahabharata continues to enchant readers and scholars the world over. This new rendering brings the epic to the contemporary reader in sparkling modern prose. It brings alive all the excitement, magic, and grandeur of the original - for our times. I LOVED this book. It is amazing. I have read translations of the Mahabharata before, but none that are as long as this one (the first volume with the appendices, weighs in at about 900 pages). And I haven't even gotten to the main event yet. This entire first volume is build-up to the great war on Kurukshetra. But what a build-up it is! I do not consider myself a religious person, but I think that Hinduism is so thoroughly ingrained in India that it is impossible for me to separate the two. The superstitions, the myths, the temples, the grandeur- it surrounds you. Indians still wear the same clothes today that they wore 5,000 years ago, when the epic was written. We still worship the same gods, perform the same ceremonies, and have the same biases. The caste system, in all its crippling glory, still exists. We eat the same food, celebrate the same holidays, go to temples that are built in the same architectural style. It's really kind of amazing. The Mahabharata is supposed to be a religious book. And, certainly, once you get to the Bhagavad-Gita, it becomes much more religious theory-based. But this first volume is more of a story (and a really good one, at that), and it centers around behaving well and staying on the right path even when you really, really don't want to. The story is more like the Odyssey or the Iliad than the Bible, as it tells the story of so many people, and the gods (all of whom have distinct and very human personalities) are just as involved in the story as the mortals are. I think Menon's translation is great- it doesn't leave out any of the less flattering parts, or the more "R-rated" parts (which, considering the way Hindus have steered towards conservatism over the past few hundred years, says a lot about how the religion was originally practiced). It just tells the story in an interesting and readable way. Yes, all the men are heroic and manly and perfect. Yes, all the women are gorgeous and slender and chaste. But the book is action-packed and a great way to learn about Indian history in an entertaining way. I will definitely be snatching up Volume 2 of this re-telling, and I can't wait to do so. Highly recommended, for anyone with an interest in India, its history and its traditions. If, however, you are looking for a slightly shorter version just to get your feet wet, I recommend Kamala Subramaniam's version (also called The Mahabharata). Here is the Amazon.com page for it. And if you just want to read the Bhagavad-Gita, that portion of the Mahabharata is available in many formats, as well. Edited to add: This book would be improved by a family tree. I've been searching for a good translation of the Mahabharata to tackle, and you've convinced me! Thanks for the great review, I've added your blog to my RSS feed! Terrific review. I have been thinking of reading the Mahabharata, and wondering which version would be best. Based on your post, I think I'm going to try this one. If you haven't already read it, you might enjoy The Palace of Illusions, by Chitra Banerjee Divakaruni. It is a fictional account of select parts of the Mahabharata. It was compulsively readable.